If you have casement windows, then your only AC option is a casement or slider window air conditioner designed for vertical openings. Very few brands make casement window ACs, but we rounded up six vertical window air conditioners from four different manufacturers, and one of them should meet your needs. Here’s a summary table of the six best sliding window ACs. Their reviews follow. 8,000 BTUs, 250-350 sq. ft.
8000 BTUs, 250-350 sq. ft.
10,000 BTUs, 350-450 sq. ft.
Next, we review each of these vertical window air conditioners before a brief buying guide designed to help you choose the best unit for your AC purposes. But first, clear up the confusion. These units are called by many names. Casement and gliding/sliding window air conditioners refer to the window types that they fit into. Vertical window air conditioners is used because they tend to be taller than they are wide. However, some also call them horizontal window air conditioners because the windows they fit into open horizontally rather than vertically, like a double-hung window. There are three 8,000 BTU casement window air conditioners and three 10,000 BTU window units. Those are the only sizes available in casement window ACs. This Frigidaire sliding window AC removes 8K BTUs of heat per hour, so does a good job cooling space up to 350 square feet. It has a good group of features. Here are the key points to consider. Features: 24-hour timer, full-function remote, Sleep mode, Energy Saver mode, 3-speed fan. Pros: Narrow window AC, has all the features needed for convenience and making the room comfortable. Positive ratings are 73% to 77%. Cons: Nothing major. Energy Saver mode reduces cooling, but that should be expected. You might want to use plexiglass instead of the foam supplied to fill the gap between the top of the AC and the top of your window opening. Negative ratings are about 12% to 14%. Many of them have to do with the unit being dented upon arrival, something Frigidaire seems to have addressed with better packaging. 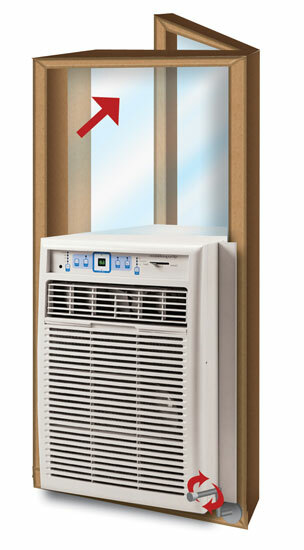 This is an 8,000 BTU Koldfront casement window air conditioner with basic features only. On the positive side, this is an Energy Star casement AC that delivers lower operating costs. Compared with the Frigidaire model, it is an affordable sliding window air conditioner. Features: Full-function remote, Energy Saver mode, 3-speed fan. Pros: Energy Star. Compact window AC. Affordable. Positive ratings are 74% to 76%. This Arctic King sliding window AC delivers 8K BTUs of cooling. It has an auto-restart mode, so that if the unit is running when there is a power outage, it will turn back on at the same thermostat setting when power is restored. When you choose Follow Me mode, the AC will use the temperature where you and the remote are to determine how much cooling it puts out. Features: Full-function remote, auto-restart, single-speed fan, Sleep mode. Pros: Energy Star. Compact window AC. Positive ratings are about 80%. Cons: Doesn’t have a timer. Single-speed fan doesn’t allow for quieter, gentler cooling. Weighs more than most slider window air conditioners and is slightly wider than other 8K BTU models. This 10,000 BTU casement window AC has a lot of features that improve indoor comfort. The remote includes a separate thermostat. This unit also has Follow Me mode (see the Koldfront AC description). AC mode lowers the temperature. Fan mode moves the air and creates a little white noise. Dry mode dehumidifies the room without cooling. It’s an ideal mode for cool, damp spring and fall days when you want to get rid of the clammy feeling. You can also choose Auto mode, which selects the best mode to meet the thermostat requirement based on indoor climate conditions. Features: Remote, auto-restart, Cool/Fan/Dry/Auto modes, Sleep Mode too, programmable timer. Pros: This PerfectAire casement window AC is more compact than some 8,000 BTU models. It has the widest range of features available and is light. 67% to 70% of the reviews are positive. Cons: Louder than most other casement window units. That is the biggest complaint, so this unit might not be the right choice for bedroom installation. About 15% of the reviews are critical. 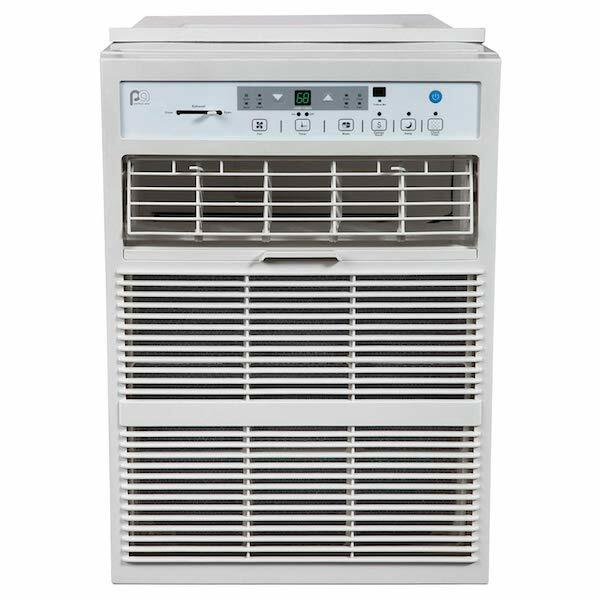 This is from the same Frigidaire series as the unit above but in the 10,000 BTU slider window air conditioner size. The Frigidaire 10,000 BTU window AC for horizontal windows has a full range of convenience and comfort features including a 24-hour timer that allows you to program when the unit runs. The timer allows you to leave home with the unit off, and if programmed, it will come on and cool your space before you arrive. That’s the best way to reduce energy use and still have a comfortable room or apartment. Features: Remote, Programmable timer, 3-speed fan with Auto setting, Cool, Fan Only and Energy Saver modes. Pros: Good climate control features, affordable cost for a 10K sliding window air conditioner. 77% to 80% of reviews are positive. This is the 10K BTU version of the Arctic King casement window air conditioner listed above. It operates on a standard 110-volt plug, so you won’t need to install a 220V outlet. Like many window air conditioners, this one has a “slinger-up” ring that splashes water removed by the AC onto the outdoor coil/radiator for faster, more efficient cooling. Features: Remote, Follow Me mode on remote, multiple fan speeds, 24H timer, Auto/Cool/Dry/Fan/Sleep modes, dirty filter notification, Exhaust feature to remove polluted indoor air. 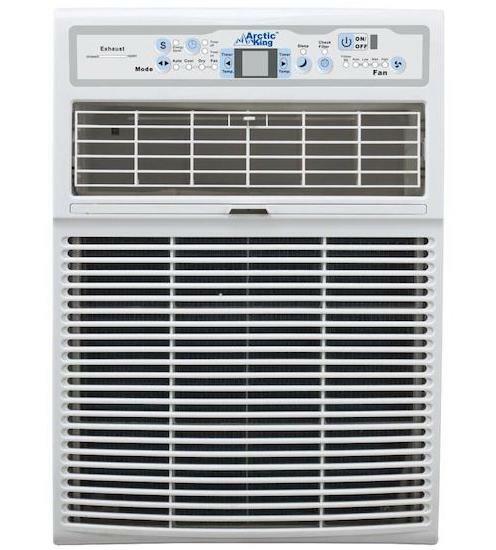 Pros: Good climate control features, affordable cost for a 10K sliding window air conditioner. 77% to 80% of reviews are positive. 70% of the reviews are positive. Cons: Heavier than other 10K BTU gliding window models. Less than 20% of the ratings are critical. You only have two options, unfortunately. Here’s how to choose, and it’s more than just the square footage of the room or zone. The Department of Energy gives further guidance on sizing a casement window air conditioner. Shady: If the room/zone is shaded, you can get by with the designated size or possibly a smaller AC than recommended. Sunny: If it’s sunny, you should choose a larger size. Crowded: If the room usually has 2 or more people in it, you might want the larger size. Cooking: If the slider window air conditioner will cool a kitchen, you definitely should choose the larger size. Here are a couple examples to show how to size your window AC. 20x16 bedroom = 320 square feet. If the room is shaded, then the 8K unit is perfect. If it is sunny and warms up in the afternoon heat, then choose a 10K unit. 16x12 kitchen = 192 square feet. Normally, that amount of space would require a 6,000 BTU window air conditioner. However, since the stove or range top might be frequently in use, you should consider an 8,000 BTU unit. If the kitchen is 300 square feet or more, then the 10K unit would be a better option. Horizontal window ACs in our list – in any list – come in basic and affordable models with some features and top-of-the-line models with all the features. We chose a selection, but they have one thing in common – good dependability and quality. Which type is best for you – Basic, Better or Best? Basic works for you: You want the space cooled and don’t care about advanced modes like Exhaust, Fan-only, Sleep Mode or Energy Saver Mode. Tip – A lot of consumers don’t like Sleep and Energy Saver modes because the ACs don’t run as cool during those modes. To these people, those modes could be renamed “warm” modes, and that’s not why they bought the AC to begin with. Window air conditioners in this range have some, but not all, the features available. Comfort: Various modes allow you to choose the right comfort setting for the indoor climate conditions such as Cool/Dry/Fan. Convenience: Timers allow you to program the AC to come on. You don’t have to leave it running, but you will still have cool air when you want it. Follow Me thermostats are innovative. If you’re across the room from the AC, then it will choose a high fan speed to push cool air your way. If you’re close to the AC, it might choose a slightly higher temperature and a lower fan speed to optimize your comfort without making you chilly.